Review by AllTheBestFights.com: 2016-08-31, disappointing fight between Ryoichi Taguchi and Ryo Miyazaki: it gets two stars. The Wba light-Flw champion Ryoichi Taguchi entered this fight with a pro boxing record of 24-2-1 (11 knockouts) and he is ranked as the No.5 light flyweight in the world (currently the #1 in this division is Donnie Nietes). He lost to Naoya Inoue in 2013 but since then he has won six consecutive bouts beating Juan Jose Landaeta in 2016 (=Taguchi vs Landaeta). His opponent, the former Wba minimumweight champion Ryo Miyazaki, has a record of 24-1-3 (15 knockouts) and he entered as the No.27 in the same weight class. He also suffered his last defeat in 2013, against Teerapong Uthaida, and then he has won four fights. 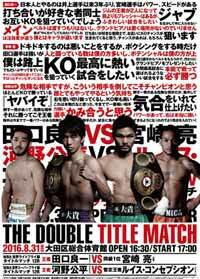 Taguchi vs Miyazaki is valid for the WBA World light flyweight title; undercard of Luis Concepcion vs Kohei Kono. Watch the video and rate this fight!